Emilia is about to marry the grandson of a duke when she is kidnapped by the former fiance that jilted her years before. Hamilton Sparrow swears her life is in danger and he has to protect her. Worse, he's actually right. The two try to figure out who is attempting to kill her, as well as keep their emotions in check. Considering how closely they have to work together, this is a much harder task than they originally thought. 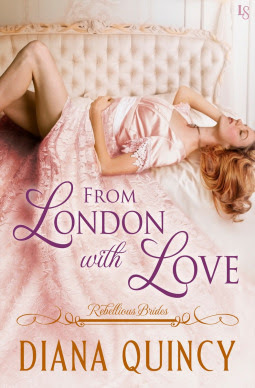 As part of the Rebellious Brides series, some of the characters from prior books have cameo appearances. Not knowing the details of their stories won't spoil anything for this one. Emilia is a typical Regency heroine: she has underlying personality traits and some physical characteristics that aren't popular with the ton, but set her apart and are loved by the hero. She hides her individuality so that her fiance will think she's a perfectly biddable bride; she has no emotional attachment to him, but hopes to travel the world and study art. This becomes a hook for Sparrow to work with her, and is part of the larger mystery behind who is targeting her. The tension between Emilia and Sparrow is fun to read, and the love scene is full of emotion as they finally get a chance to express their longing. There's the requisite happily ever after, but it fits the characters and is well earned.